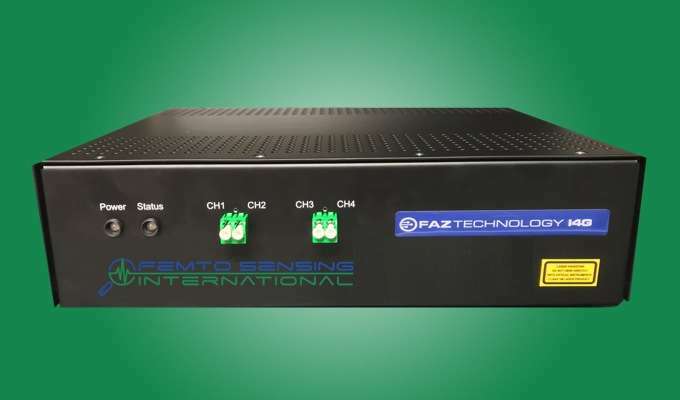 Abstract: FEMTO SENSING INTERNATIONAL (FSI) releases its FAZT-I4G FBG Interrogator, the first in a new family of industrial grade premium performance and high reliability optical sensing instruments based on FUGRO’s patented technologies. The FAZ-I4G Interrogator is designed to serve civil and geotechnical engineering, aerospace, marine, railways, energy, industrial and other applications. FBGs are reliable all-fiber optical components which are used for making accurate and reliable temperature, strain and other measurements for over two decades. However, due to previous technical limitations, many commercial grade applications could not be properly addressed. A particular challenge existed with FBG Monitoring Instruments that needed to exhibit both (1) ultimate precision and repeatability static and dynamic measurement capabilities and (2) a level of reliability and ruggedization that meet or exceed the requirements of industrial and commercial customers worldwide. The new generation of CE Certified and ruggedized FAZT-I4G interrogators are dedicated to fill this industry need and are now readily available for deployment. 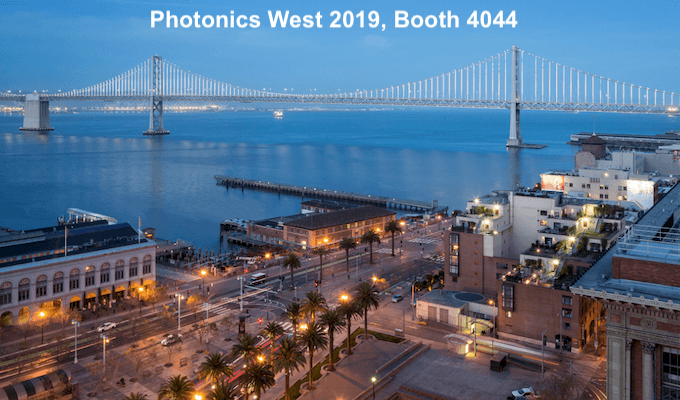 Top reliability: Solid-state design based on true integrated chip tunable laser that uses no movable parts, no tunable filters, and no opto-mechanical switches. Ultra-high repeatability: <50 femtometers max (20fm typical). Required for measurements where small drifts even within the accuracy of the instrument are damaging to the value of the high-quality measurement. Ultra-high precision and accuracy: Absolute 0.1pm precision and 1pm accuracy. Note: Accuracy alone is not enough. An accuracy of 1pm means little if an instrument’s precision or repeatability is only 5-10pm, as in that case one’s overall error of measurement is still 5-10 pm. One needs (1) precision, (2) accuracy, and (3) repeatability to have a high-quality measurement.The FAZT-I4G uses proven and patented world’s best “Gas Cell – Etalon – MZI – and PM Optical Circuit” calibration architecture, which is required for discerning between signal and noise when small changes in strain, temperature, and many other parameters need to be exactly measured. Internal polarization mitigation: Hardware and software to greatly reduce potential measurement errors that may be caused by fiber and/or FBGs polarization. These are often induced as a result of bending or fabrication or installation non-uniformities; for example, such errors are reduced from 4pm to 1pm. Adaptive to more types of FBG sensors: Able to accurately monitor more types of FBGs than any other instrument, including narrow bandwidth (40pm-120pm) FBGs such as those used in high-sensitivity accelerometers, pressure sensors, hydrophones, and microphones. Power gain control for each monitored sensor: Able to set the gain for each individual sensor, not just for the whole instrument or just for each channel. This is very useful to recapture the data and continue monitoring sensors whose signal becomes too weak after field installation and settlement. Synchronization: TTL trigger for synchronized operation of multiple I4G instruments or for synchronizing to other electronic measurement systems. Expandable from 4 to 64 channels with no compromise in precision, accuracy, repeatability or scanning range Scanning speed trade-offs apply. Industrial grade design scales well for dramatically lower prices with volume. 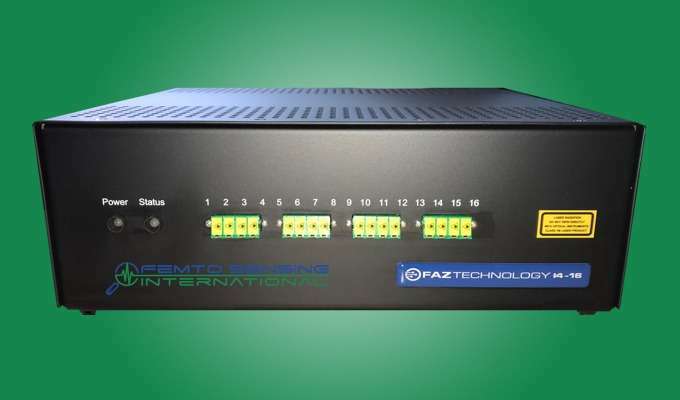 Ingemar Ernstsson, Director of Applications Engineering at FEMTO SENSING INTERNATIONAL commented that “The strategic cooperation between FUGRO and FSI has delivered its first result: The FAZT-I4G is now available and supported by FSI worldwide. We look forward to having many successful future premium-grade instruments releases to serve our customers and their applications worldwide, as a result of the growing cooperation between our companies”. FUGRO is the world leading provider of geo-intelligence and asset integrity solutions. These are critical to the sustainable development of natural resources and sustainable construction and operation of large facilities and infrastructure.FUGRO is headquartered in The Netherlands and has facilities and operations worldwide (www.fugro.com). Its FAZ Technology Optical Sensing R&D Center is in Ireland (www.faztechnology.com).